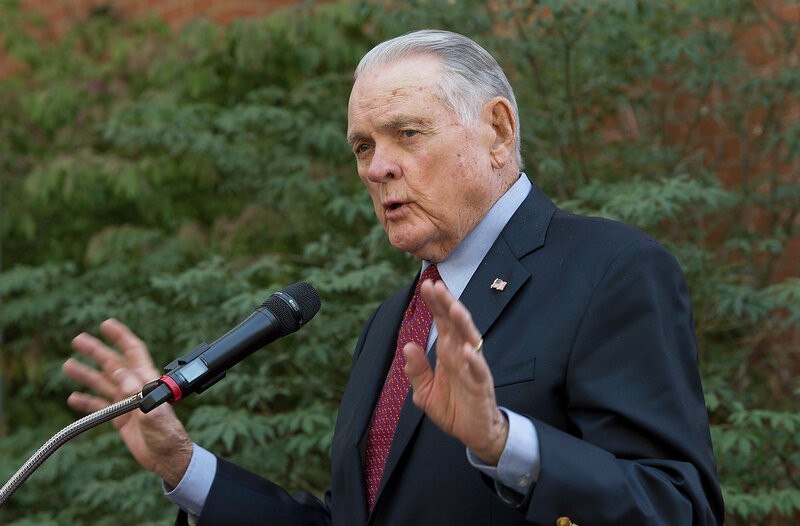 The United States Sports Academy is mourning the loss of Academy honoree and legendary sports broadcaster Keith Jackson, who died 12 January 2018 at age 89. Photo courtesy of Bob Hubner, Washington State University. The United States Sports Academy is mourning the loss of Academy honoree and legendary sports broadcaster Keith Jackson, who died 12 January 2018 at age 89. Jackson, who retired from broadcasting in 2006, is widely regarded as the voice of college football after spending 50 years in the business. He earned the Academy’s Ronald Reagan Media Award in 1990. The award, named in honor of the 40th President of the United States, is presented to an individual for outstanding contributions to sport through broadcasting, print, photography, or acting. The honoree exhibits imagination, excitement, and genius in kindling a keen public interest and appreciation for the role of sport in modern society. Jackson was known for his down-to-earth, folksy manner and his colorful expressions. He coined the phrase “Whoa, Nellie” after big plays and was the first to call college football’s largest players on the offensive and defensive lines the “Big Uglies.” He was also credited with being the first to call the Rose Bowl the “Granddaddy of Them All” and gave the University of Michigan’s football stadium the nickname “The Big House.” Many of his phrases have since become part of the college football lexicon. In 1999, Jackson earned the National Football Foundation and Hall of Fame Gold Medal, the highest honor awarded by the organization. He was also named to the Rose Bowl Hall of Fame. He was the first broadcaster to be awarded those honors. Though best known for his work on college football broadcasts from 1952 until 2006, Jackson also announced numerous other sports for ABC including Major League Baseball, NBA basketball, auto racing, boxing, PGA Tour golf and the Olympic Games. He was involved in ABC’s coverage of the 1972 Summer Olympics in Munich, when an attack by Palestinian terrorists rocked the world’s biggest sporting event. He covered a total of 10 Olympic Games in his career. He was also a member of the broadcasting team for the first Monday Night Football broadcast in 1970. A native of Roopville, Ga., Jackson earned his bachelor’s degree in speech communications from Washington State University (WSU) in 1954. In 1999, WSU’s Edward R. Murrow School of Communication gave Jackson the Murrow Award for top leaders in the communications industry. He was a charter member of the WSU Foundation, which provided scholarship money to the Murrow School. He was a member of the American Sportscasters Association Hall of Fame, National Sportscasters and Sportswriters Association Hall of Fame and he became the first sports announcer to earn the American Football Coaches Association’s Amos Alonzo Stagg Award.